Our goal was to determine if we could use a modified beta MultispeQ instrument to predict soil C and N using NIR/Vis reflection from soil samples at six distinct wavelengths. We used a random forest ensemble learning model to generate prediction models: based solely on MultispeQ data, combining MultispeQ data with other soil characterization metadata, and based solely on soil metadata. The MultispeQ only and MultispeQ + soil metadata models had testing set r2 values between 0.79-0.80 for soil C and between 0.64-0.70 for soil N. These preliminary results suggest that the modified MultispeQ has the potential to accurately predict soil C. In this project, adding soil metadata to the models resulted in only small increases in the accuracy of the training and test sets. 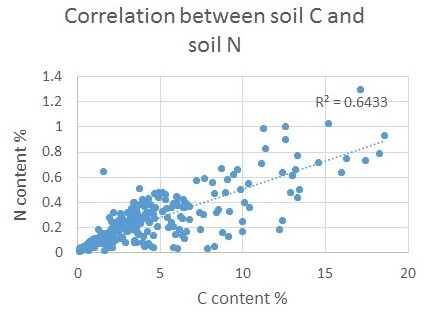 The accuracy of the soil N predictions were much lower than for soil C, and may have been driven by the relationship between soil C and N in the soil samples. A collection of 271 archived soil samples from 10 states were used in this project. Soil samples were oven dried and passed through a 2 mm sieve prior to being measured by the MultispeQ. For each soil, three technical replicates from each sample were placed on a petri dish and measured. The MultispeQ has LED’s on both the main board and the add-on clamp. In order to measure with all six wavelengths--530 nm, 605 nm, 650 nm, 720 nm, 850 nm, 940 nm--one measurement was taken with the main board LED’s and then another sample was taken with the add-on LED’s. Measurements were taken with the MultispeQ about 1 cm above the soil samples. In addition to MultispeQ data, we wanted to test whether other metadata characterizing the soil samples could be used to improve the C and N prediction models. 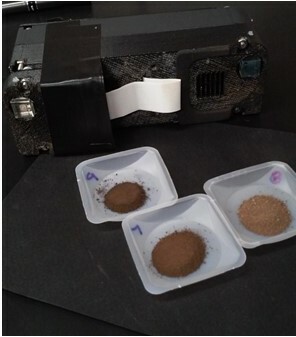 We determined the distribution of sand, silt, and clay particles, bulk density, and CaCO3 for each sample using the NRCS web soil survey (http://websoilsurvey.sc.egov.usda.gov/App/HomePage.htm). First, we built a prediction model using only the MultispeQ data. We can see that the testing set has a good r2 (0.793), but it is lower than the training set (r2 = 0.941). This indicates that the model is somewhat overfit, but still quite good. In the next graph we add meta data to the prediction. In this case, we add the percentage of sand, silt and clay. In this model we see that the r2 of the training set increases slightly, while the accuracy of the testing set is the same as the model which only used MultispeQ data. If we add additional metadata, such as soil depth, bulk density and carbonates, the accuracy of the training set and test set are not improved (data not shown here). Finally, we want to see how well the soil meta data will predict soil C in the absence of MultispeQ data. The training set continues to show very high accuracy. However, the test set has a very low accuracy (r2 = 0.206) indicating that the model is over-fit and not suitable for predicting soil C.
The results for predicting soil N were very similar to those in the previous section. The models incorporating just MultispeQ results and MultispeQ + soil texture data had very similar training set accuracy and similar test set accuracy. However, the difference between the r2 of the training and test sets was larger than for C, approximately 0.3, compared to a drop of 0.15 for the C data sets. This suggests that over-fitting was more of a problem when predicting soil N with MultispeQ data than predicting soil C. Again, using soil metadata only resulted in very poor predictions of soil N. Furthermore, there was a very strong correlation between soil C and soil N, it is probable that our prediction of soil N is based on the relationship between soil C and MultispeQ data and not a direct relationship between soil N and NIR/Vis at the wavelengths we used. Lastly, we wanted to test if the accuracy of C predictions could be increased using a set of soils from a specific region. In this case, we used the exact same models as above, but removed all of the data from outside of the Northeast, USA. After eliminating soil samples from out of the region, we were left with 156 soil samples, with 127 in the training set and 29 in the test set. First, we see that using only the MultispeQ wavelengths the accuracy of the test set (Figure 8) was slightly increased from the test set of the whole data set shown in Figure 1. Adding soil metadata (soil clay, silt, and sand and the depth of the soil sample) further increased the model fit to an r2 of 0.843. Even though this project used only a small number of individual soil samples (271), the results suggest that modifying the MultispeQ for NIR/Vis reflection has the potential to predict soil C and N. However, in the short term, the accuracy of soil C predictions are likely to be better using local or regional soil libraries rather than global data sets. Practically speaking, this means that if the device were calibrated to the soil types and locations where the soil samples were collected, then the soil C predictions should be very accurate.